Three 4A superstars Kenya Livingston (Rocky River), Morgan Smalls (Panther Creek) and Addie Renner (Myers Park) travelled to New York to tackle the nations best high jumpers each having a shot at winning a national title. The three faced off recently at the NCHSAA 4A State Championships where the went 1-2-3 with Smalls taking the state title from defending champion Livingston jumping 5-8. Yesterday's field had a few girls that have cleared 6 foot over their careers, with the top seed from this indoors season being at 5-11. Livingston has been in contention for All-American spots for the last two years, and she would have one final shot at in over the weekend. The competition was tight. There was zero room for error on any early jump as earning misses could hurt you down the line. Livingston did have one miss at her opening height of 5-3, but she Smalls and Renner were able to clear up to 5-7 without any misses. As the bar was raised to 5-8.75 Livingston was in a grove and cleared her height on the first attempt, setting herself up really well for possibly winning a national title. She and Anna Hall (Colorado) were the only two to clear 5-8.75 on the first attempt. Smalls and Renner missed all three attempts putting themselves in a tie with two other athletes who had no misses for fourth place. Livingston was left to battle Hall and Nyagoa Bayak of Maine as they went for 5-11.25. None of the three athletes were able to clear the height. Due to Livingston's miss at 5-3 it crowned Hall the National Champion. Hall passed a 5-3 and didn't have any misses until 5-11.25. If Livingston had cleared 5-3 earlier in the event the two would have went to a jump off for the national title. Bayak had three misses prior to the final height and took 3rd overall. The nation needs to take notice of North Carolina High Jumpers. When you combine the boys and girls the state produced 5 All-Americans, with only Livingston being a senior. Smalls is a sophomore, Renner a junior and Charles McBride and Randolph Ross on the boys side are also juniors. Strong competition in state showed to really help these girls produce on the national stage. 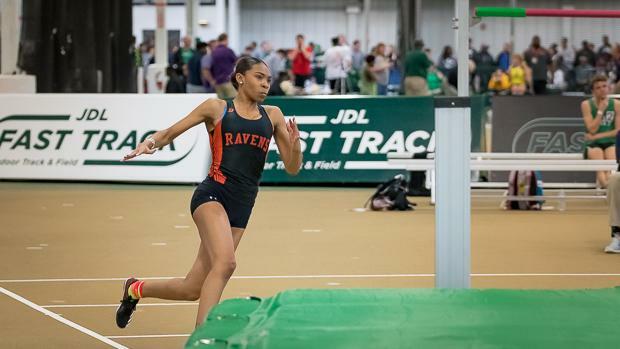 In Renner's case from this season she took 3rd at the NCHSAA 4A Indoor State Championships, but very well could have been a national champion after this weekend. With Renner and Livingston being in the same conference one could not win at the conference level, but win on the national stage! It'll be exciting to see what is in store for these three outdoors.